You know that old saying, “You can’t have your cake and eat it, too?” Well, I just did. And this recipe proves that you can. Meaning, when we don’t want to stop eating nutritious food but we want something sweet like cake, it’s possible to have both. Like with these delicious baked donuts, made of whole-food, nutritious ingredients instead of butter, sugar, and white flour. Really! These lemon chia donuts are fluffy, lemony, and satisfying. My taste testers ate them with great enthusiasm, never knowing that they’re sweetened with coconut nectar and the frosting gets its rosy color from purple sweet potato, providing good stuff like Vitamins A & B, potassium, protein, fiber and magnesium. In the frosting! Coconut nectar is in both the donut and frosting, and it’s considered low glycemic and is packed with minerals, B & C vitamins, and amino acids. I recently came across tigernut flour, and I’m a fan. Cool name, right? It’s actually a small root vegetable but has a nice nutty flavor and light color, so it’s great for baking. Compared to almond flour, tigernut flour has about half the fat, twice the iron, and three times the fiber. I’m hearing a lot about the importance of food variety, too, which can help improve nutrition intake, so this is a nice way to do that - and eat dessert! See, have your cake and eat it, too. You may spot organic tigernut flour at your local health food store. I buy it at Thrive Market - it’s so easy to just have it delivered. Almond flour would probably work fine in this recipe as an alternative if you can’t find tigernut flour, though I haven’t yet tried it myself. If you do, let me know how it goes. I’ve found edible organic dry rose petals at Whole Foods. They also might be available at your local health food store. Keep in mind, these are baked donuts, so the texture is more cake-y than traditional deep-fried donuts. 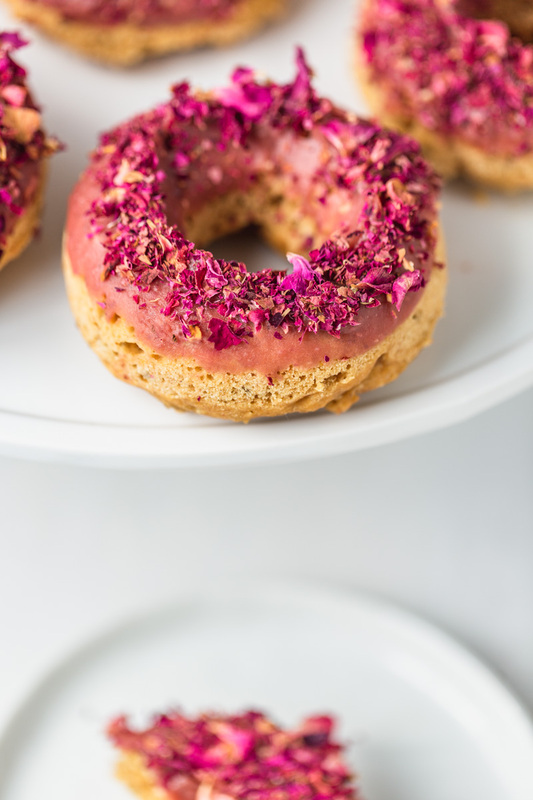 I love the rose frosting paired with these lemon chia donuts, though they’re great on their own, too, or with a simple glaze or a dusting of powdered sugar, if you’re ok with a little sugar. So go ahead, have your cake and eat it, too! Note: For the frosting, make one batch of Vegan Sweet Potato Rose Frosting. I’ve included information below on when to incorporate the frosting steps for your convenience. Roast the sweet potatoes for the frosting. In the meantime, combine all the dry ingredients in a large bowl, like that of a stand mixer. While stirring, add the wet ingredients. Mix until well combined. Dampen your donut pan(s) and coat with oat flour, as shown here. Make sure to tap out excess flour. Alternatively, spray the pan lightly with cooking spray. Fill each section of the pan equally, about 2/3 full. Once your sweet potatoes are roasted, turn the oven down to 350 degrees. Bake the donuts for about 15 minutes, until they’re a bit springy and a knife comes out mostly clean. While the donuts bake, begin making the frosting. Let cool for about 10 minutes before eating or frosting. 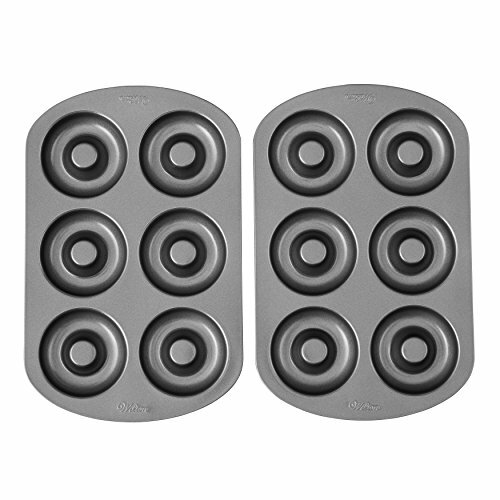 To frost the donuts, place frosting in a wide shallow bowl, deep plate, or pie dish. Holding the donut firmly, dip the top of the donut into the frosting and twist, working to cover the whole top of the donut with frosting. Pull the donut away as you twist. If the donut needs more frosting, simply dip again. Sprinkle the dried rose petals over the top. Product links that take you to sites like Amazon and Thrive Market allow you to conveniently get more info and purchase items associated with this recipe. Using these links is a way for Beautiful Ingredient to earn commissions at no extra cost to you. Thanks for your support!